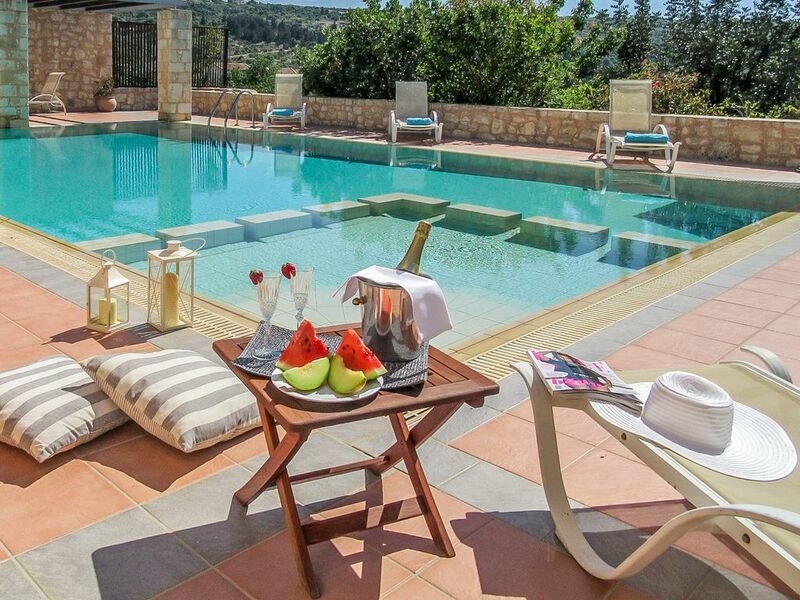 Villa Alkyoni is a stone built villa in the traditional village of Gavalochori, 25km east of Chania Crete. Its unique architectural style is combined with modern facilities in order to provide an ideal environment for your holiday. The villa features 300 m2 of living space on a 1000 m2 plot of land. It offers complete privacy with its own parking space for two vehicles, garden and pool. The villa can accommodate up to 10 guests. It offers a stunning view of the White Mountains. Pool size is 18m x 6m. Up to two cribs and high chairs are provided for infants. A computer with internet connection is provided. Free WiFI access. Great villa, huge for six of us! Lovely property in village with great restaurants and shops. Ideal base and very relaxing. Just a shame pool not heated as too cold for more than a brief splash! Amazing architecture. Lots of baby stuff everywhere, but we made due. Pools were awesome! Loved the area. Fosio is wonderful! We ve had a perfect stay in this beautiful house. Large bedrooms, well equiped kitchen and the huge living room and nice terrace have a wonderful view to the white mountains. The pool is large and well maintained and behind (one terrace below) is even a nice garden where our kids loved to play. We were with 3 young children (5,4 and2) and it was very easy to close the stairs to the swimming pool with a chair, so our youngsters could not enter the pool unguided. That felt very safe. Mrs Frosso came by every day to maintain the house. She is really Nice, speaks English and knows a lot of the environment. The house is situated in a litlle village with a bakery, a few little supermarkets and Some Nice restaurants. It is a little but charming and friendly village. Nearby in Almyrida is a Nice beach (safe for little Children). I really can recommend this beautiful house! A wonderful , relaxing week! The villa was spacious , clean , and in a wonderful location , up a steep hill but overlooking the village with the mountains in the distance , a treat waking up every morning to the ever changing view. Each room had a balcony , and there was a big dining table outside with steps down to a large pool . We had a friendly cleaner who came in daily which was a bonus and was there to give advice if needed. The village was very quaint with a folk museum and a couple of supermarkets plus a bakery selling pastries which seemed to be open all the time! We ate out at two excellent tavernas - not a lot of meat available in the supermarkets for home catering. The beach was three kilometres down a very winding mountain road ; plenty of restaurants on the water front and a sandy beach with safe bathing round the bay. We hired a taxi and spent a day in Chania which was much busier than we remembered from years ago , but worth a visit and lots of restaurants round the pretty harbour to choose from. The owner ,Christos was easily contactable and helpful and we had no problems while we were there. Perfect place to unwind with a group of friends and family! The house is as beautiful as in the photos. We were a group of three families with several children and never felt crowded. The place is clean and well maintained. Mrs. Froso comes by daily and is helpful. The kitchen is fairly well stocked with tablewear and glasswear. The location is nice, can walk down the hill to the village for charming tavernas. It takes about 10-15 minutes to the nearest beach by car. I had hoped to walk to the beaches but the route is not ideal for walking ( no trails and the roads are narrow, winding, and busy). The outdoor area of the house is amazing, great views of the mountains from the veranda. Lovely to sit out in the morning or evening and have breakfast/dinner or watch the kids enjoy the pool. The village is small but charming with friendly and helpful locals ( try the apple pastries from the bakery). Definitely hike the Samaria gorge- was the highlight of our trip. We also enjoyed Olive oil tasting at the traditional mill- Biolea, seeing nearby ruins, and the beaches, especially Falasarna. We had a great time in Alkyoni and would definitely recommend the house. Thanks for a wonderful week in Crete! Thank you for selecting villa Alkyoni for your holidays. It was a real pleasure to host your travelling group! Thank you so much, you are always welcome! Gavalochori is a traditional Cretan village situated in the Apokoron region about 3km inland from the coastal village of Almirida. Gavalohori is an old historical village with approximately 500 residents. It is a typical Cretan village with a small square where a coffee shop, a bakery, a mini mart, two tavernas and other convenient stores can be found. Several narrow streets branch off its center and one could wander through several interesting sections of this officially protected village. Stone built houses with lovely backyards full of colorful flowers can be found. A lot of interesting buildings can be seen, such as the 18th century two-room, arched olive oil press, the temples of Panagia and Agios Sergios, the old school, and the historical folk art museum. Within a short distance (5km) from tranquil Gavalochori one can drive to Almirida, a picturesque coastal village. You may dine there in one of several seaside tavernas or relax sipping your drink by a bar during sunset.